The name may be a bit misleading here as I haven’t actually stuffed the bellpeppers(capsicum) while taking pictures, the reasons being the bellpeppers were too big. The paste can be stuffed into bellpeppers like this or this if you get smaller ones. 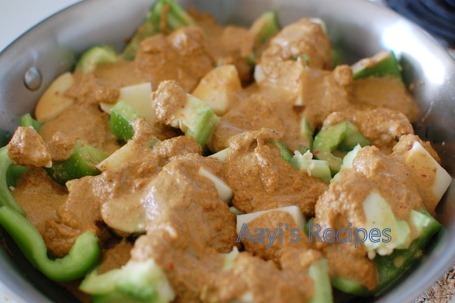 This is again a recipe from my friend Roopa. She made ennegayi with eggplants for us when we visited them in December. The main difference in her recipe was â€“ she used one green bellpepper cut into pieces and one potato along with the stuffed eggplants. It made such a huge difference to the taste. She was also generous in using oil, I am very stingy when it comes to using oil in my dishes, so they taste quite different. Also, after stuffing the eggplants, she cooked them in pressure cooker (till it gave one whistle). I am so glad I had seen her making this dish, so I could follow the same in my kitchen and get the same results. Next time, I prepared this only with bellpeppers and potatoes, as it was much easier to make it on weekdays for me. This has become a regular at my home now. 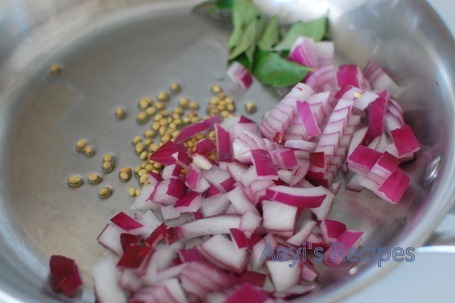 Heat oil, add coriander seeds (optional),onion, ginger, garlic, curry leaves. Fry till onions become translucent. 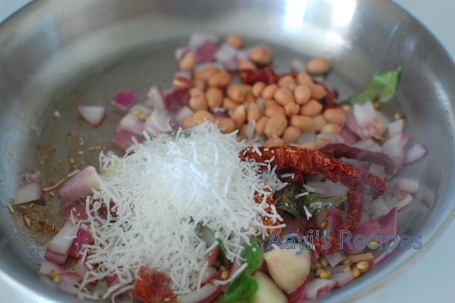 Add red chillies, coconut, peanuts, fry for some time. Grind with jaggery, tamarind, coriander leaves, garam masala, salt. Do not add too much water. Cut bellpeppers and potatoes into big pieces. In a flat bottomed pan, spread some generous amount of oil. Spread a layer of bellpeppers and potatoes. Now add paste on the bellpeppers and potatoes. Add a very little water. Cover and cook till done (cook on a medium heat). 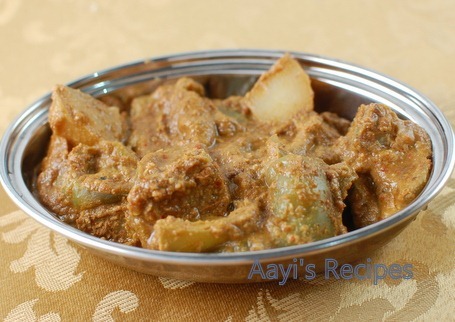 Serve hot with jolad rotti or chapatis. Also this dishe Reminds me a bit about Kairasu:). Is the taste also similar ? Looks very tasty. Will try. Can you send this to me please. We will be having an abundance of bell peppers pretty soon .. thx for sharing. Looks yummy. 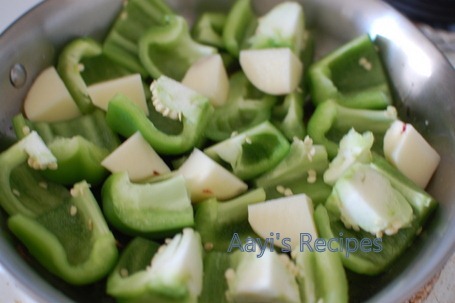 I make the similar recipe with brinjals, using capsicum is also a nice idea…. Capsicum is my fav vegetable. I never heard of this one before. Thanks for sharing aaye 🙂 Hope you visit my page mentioned below. love it Shilpa! capsicum, peanuts and potato; what not to love?! Love this prep, gravy looks really thick n delicious. Hello, I love all your recipes. I am also trying some, and getting delicious result. thank you for recipes and tips. 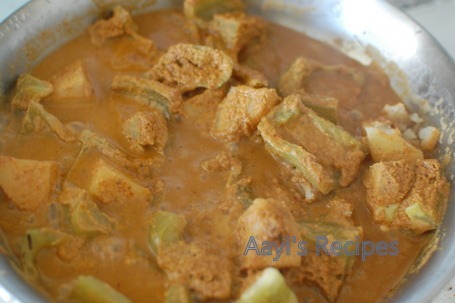 you can also visit to this site http://www.maddurvada.com/ for more recipes. First of all thanks for such a wonderful receipe. I tried it yesterday and it turned out to be yummy and very different than what we use to eat .